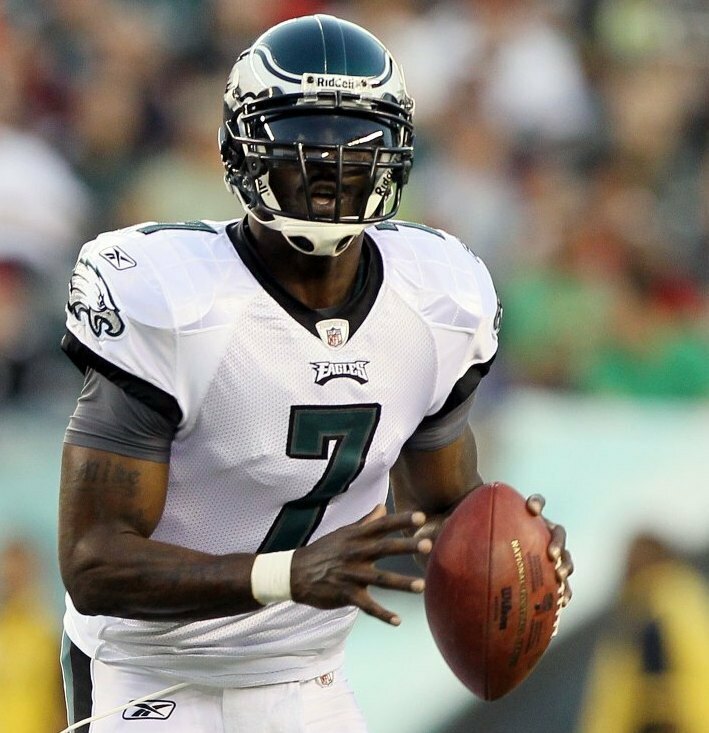 $100 Million, Six-Year Deal For Michael Vick : The Two-Way Just a little more than two years ago, Vick was finishing up an 18-month prison term after being convicted on charges related to dog fighting. What's your reaction to this huge deal? The six-year deal announced Monday night that will keep Michael Vick with the NFL's Philadelphia Eagles could be worth up to $100 million for the quarterback who just a little more than two years was finishing up an 18-month prison term after being convicted on charges related to dog fighting. Michael Vick, quarterback of the Philadelphia Eagles, earlier this month. According to the Philadelphia Inquirer and other news outlets, $40 million of the deal is guaranteed. On a per season basis, the contract has the potential to be even larger than then 10-year, $130 million deal Vick signed with the Atlanta Falcons in 2005. That deal was broken when he went to prison in 2008. Since joining the Eagles, Vick has gone from being a backup to last year reemerging as one of the game's biggest stars. Vick, 31, talked with All Things Considered in July about his post-prison work with The Humane Society of the United States and his hope that "hopefully one day [people] will say: 'That's Michael Vick, the great man, and the guy who believed in himself and turned his life around.' "
How do you feel about Michael Vick's new contract?